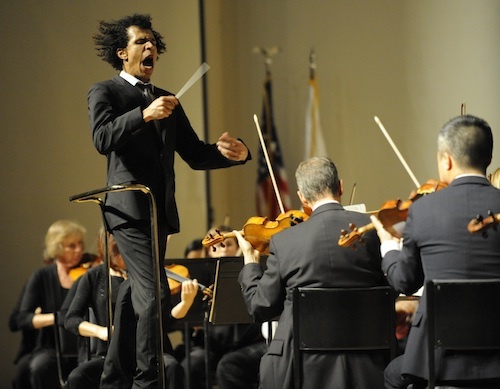 The intensity of Conductor Jonathan Heyward electrifies the air as he leads the Los Angeles Philharmonic Saturday in a capacity-filled Ingalls Auditorium at East Los Angeles College. The performance was part of the Los Angeles Philharmonic Association’s Free Neighborhood Concert program and was hosted by County Supervisor Hilda L. Solis and was embraced by ELAC. The orchestra performed a program of Russian masterpieces in Glinka’s Ruslan and Ludmilla Overture, Tchaikovsky’s Romeo and Juliet Overture-Fantasy and Stravinsky’s Firebird Suite (1919 Version).